Central Portugal is a diverse region which promises to satisfy all the senses. History buffs can delve into UNESCO World Heritage sites like Alcobaça, with its 65-foot high nave and magnificent Gothic tombs of King Pedro I and his ill-fated mistress, or the Convento do Cristo in the medieval village of Tomar. Mountain folks have the Serra da Estrela range, proud possessor of Portugal’s only ski resort. Maybe your tastes run to praias fluviais, the country’s well-known network of river beaches. Or perhaps you’d rather dip your toes in the ocean, on the famous Silver Coast. That’s where you’ll find Nazaré, one of the most popular seaside resorts in the region. Nazaré’s climate is temperate, with highs reaching toward 85 F in summer, dipping to averages around 50 F in January, the coldest month. It might not suit those who are looking for year-round sun, but even in November, for example, rainfall averages only three-and-a-half inches compared to the five inches the capital, Lisbon, receives. 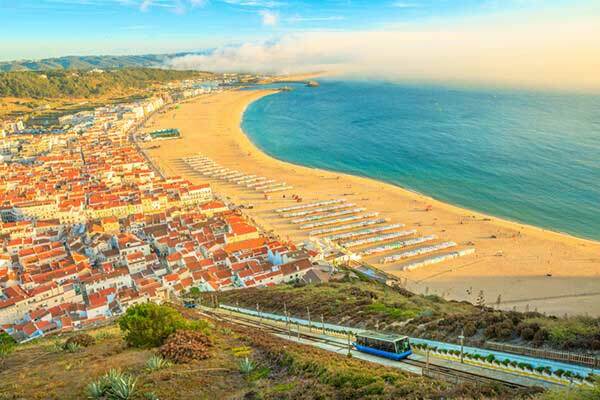 Just 32 square miles in area, Nazaré is a livable city, especially with available bus and taxi service, although it’s delightful to explore on foot. There’s a local market in town as well as supermarkets, more than 100 restaurants and cafés, and other amenities. 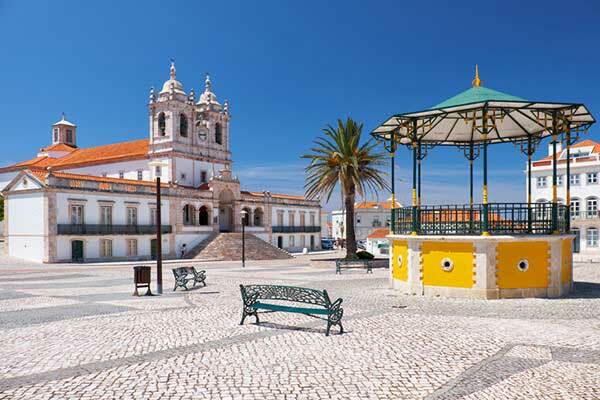 There’s already an established expat presence here, although the city is not overrun, as some popular places are, like the southern region of the Algarve, for example. That’s a plus if you are looking for a low-key atmosphere. Be prepared, however: summer is high tourist season, when crowds flock to watch fisherman dry their catch on the beach, and to purchase souvenirs from women dressed in their traditional seven-layered, flannel-skirted garb. Surfers arrive during what’s known as the Big Waves Season, generally from October through March and sometimes April, hoping to ride a giant crest and break a world record. Most consider the ocean canyon off the coastline responsible for some of the largest waves found anywhere in the world. If your retirement plans include keeping a car, you should know that Nazaré is well-located for visiting other points and cities of interest. Fifteen minutes away is the above-mentioned monastery of Alcobaça, believed to be the first Gothic building in Portugal, whose construction began in 1178. The charming walled village of Óbidos is only 30 minutes away, as are Leira and Caldas da Rainha, both of which have a Bricomarché, a home furnishings store. Leira also has a Fnac, for electronic goodies. 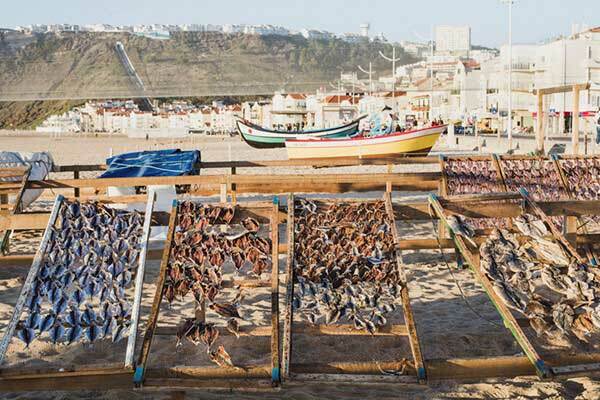 Nazaré is also just a one-hour drive both to another fishing village, Peniche, and the university town of Coimbra. The culturally-minded will be glad to know that Lisbon is an hour and a half away. You can still enjoy your surroundings without a permanent vehicle, though, as there’s always the option of renting a car for the day or a long weekend. Your typical day might begin with a steaming cup of coffee at a local café, followed by a stroll to your favorite neighborhood flower stall. The town’s market is within easy walking distance from center, where locals and visitors alike can purchase fresh fruit and vegetables, meat, fish, and bakery items like fried pumpkin cake. It’s closed on Tuesdays, but that gives you six days each week to browse and stock your larder while chatting with your neighbors. Perhaps the most attractive part of Nazaré is not Praia, the beach zone, but Sítio, the primarily residential area old town. Perched high on a cliff above the coast and town, this suburb offers magnificent views and can be reached by walking (for hearty souls), driving, or taking the funicular from below. There are small markets up here, as well as shops and stalls, a lovely square, a lighthouse, and a church which draws tourists. Our Lady of Nazaré—the named is derived from the city of Nazareth, in Israel—is surrounded by a marvelous legend dating from 1182. Sítio, with its pinnacle overlook of the ocean is also an ideal location to enjoy a sunset drink before heading back to your apartment to cook up some fresh clams for dinner. Add a loaf of crusty bread and a chilled bottle of the popular young white wine known as vinho verde, and you’ll have a dinner fit for royalty of any century. Despite Nazaré’s desirability as both a tourist and expat destination, it’s surprisingly affordable to live here. That cup of coffee at your corner café runs less than a dollar. A lunch of soup, main course, dessert, beverage (usually mineral water, wine or beer), and coffee averages less than $12. Even dinner at the number one-rated restaurant in the beach area is economical when compared to other regions in the country like Porto in the north, Lisbon, and the Algarve. For example, at Rosa dos Ventos, the check for a full dinner for two of grilled swordfish served with boiled potatoes and salad, together with a couvert of bread, butter, and olives, all enjoyed with house wine and followed by dessert and coffee is about $45. The following is a breakdown of monthly costs for two, based on recent real estate and general budget listings.